I purchased these diabetic slipper socks for my husband in black. He loves them. The only thing is if you order them in black expect them to run when washed. I haven't washed them lately so I hope they don't run again. Bought these for the grips and non tight fit. They've been a great addition to the wardrobe! Socks were purchased for my father who is diabetic and has had several strokes. The socks are a nice weight so that he is able to wear them with his shoes, if he wants. He wears them to bed and is able to get up during the night without worrying about falling. I will be buying more of these socks in the future. Love them. I will be ordering more. I can wear them and not worry about slipping and falling and they stay up without binding. Ordered these for my Mom. Way better than the gripper socks we got before. Higher on the leg and stay up better. Also cost less. I bought a few pairs for my mom last year. She likes them so much I just bought some more for her. Just what I meeded for my mama in the Convelescent Center. Thanks!! Was looking for white cotton socks with treads on the bottom. Very happy with purchase. Thank you. These socks are great for diabetic. I would recommend these socks for any diabetic. Very comfortable. My husband is diabetic and is going through chemo and radiation for lymphoma...he needed a non slip sock that would stay up. So far this is the best we have found. Very useful for my sister who can not walk and is a diabetic. When transfering her feet don't slip all over the place. They aren't binding and keep her feet nice and warm. The bottom of socks need to have more grip. Not having enlarged sections for heels, they are not perfect. They are usable for safety purposes. But how much more trouble would it be to make them with heel sections like every other pair of socks I have ever owned. There is a very small selection available anywhere, and these are the best I could find. They bunch up on top of the foot to compensate for lack of heel sections. the socks were ok for a couple washes and then lost any strength they might have had. too small for a size 12 man !!!!! I purchased these socks for my elderly mother so she wouldn't slip on hard floor surfaces. The problem is the gripper pads wear off in the wash. She has two pair that are not useful now. We have the black and now, with summer, wanted tan. I probably will order the white later on. For veterans. They only wanted socks. My husband is diabetic and his feet are numb and are prone to slip. I ordered 2 pairs last month. They worked great so now I have ordered more. I was hoping to get a price break by ordering 6 pairs this time. Unfortunately, I was charged a dollar more per pair! Not happy about that part. To be comfortable while walking around in the house. I was interested in the grips. Could no longer purchase at Walmarts and have not found in any other stores. Hopefully they are large enough. Wear a size 12 shoe. Diabetic slipper socks with Gripper Soles are great for around the house! I have problems with finding nice gripper soles, & hoping these are comfortable on my feet. Because of the nonslip sole. 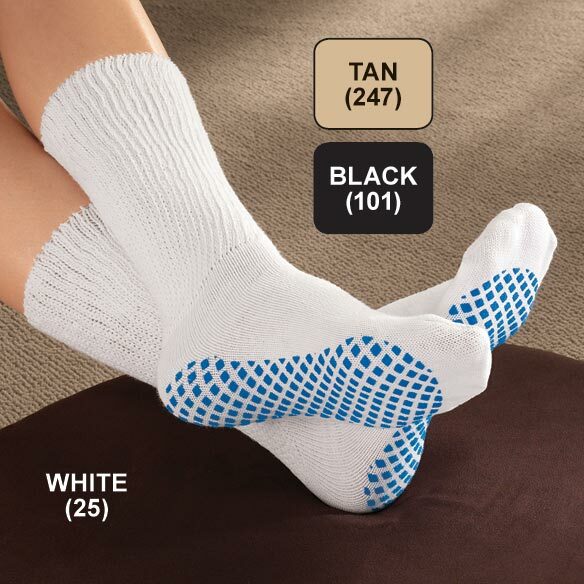 This seems to be one of the only places I can find non-slip diabetic socks. my 97 year mom loves them! for my dad - he slips easily. I like the height of sock. Keep feet warm at night and don't fall when I get up go to bathroom. My husband is diabetic and I thought these would be good for him to have. I can find lots of colored gripper socks but rarely do I find white and that is what Mom (age 90+) prefers. Needed less elastic due to edema. To keep my feet warm and give me a non slip walk if I get up at night! Wife wanted to try them. I need sock to fit size 13, for men? BEST ANSWER: Thank you for your question. These are one size fits most. We hope this information will be of help to you.